At face value, Vincent Wu, 73 years young this week, looks like many successfully retired Asian American engineers. At Atari, the company that brought the world “Pong,” Wu led the effort to bring “Donkey Kong” home–to the home PC, that is. Remember the floppy disk version? That was Vincent. But ask him about the real highlight of his life, and he’ll point to his soul and to Selma. Fifty years ago, you might say Wu helped bring Dr. Martin Luther King, Jr. home. Wu was a volunteer marshal in the historic final march from Selma to Montgomery, where he walked alongside Dr. King as a member of his security team. At 5-feet 9-and-a-half inches and 155 pounds, Wu said he wore a blue chambray work shirt and jeans, no uniform and definitely not a suit. Only a blue armband made out of plastic, like that of an air mattress, distinguished him as a member of the volunteer perimeter security team. They were never more than 10 or 20 feet away from Dr. King on the march to the Alabama capitol. Wu was a minister’s son born in the Yunnan province, China, but his family made its way to Hong Kong. At the time, the immigration quotas prevented many Chinese from coming to America. But as a minister, Wu’s father was given special passage to the U.S. to serve at the First Chinese Presbyterian Church in New York City. In 1951, Wu was just 9 and attended P.S. 59. “We lived in a mostly white neighborhood, one of only two Chinese families in the school,” he said. When I said it sounded like “Fresh off the Boat,” he laughed. As an immigrant with an accent, he could probably relate to both American-born Eddie Huang and his parents. From midtown Manhattan, Wu moved to San Francisco, right on the edge of Chinatown, and his education resume was typical for many Bay Area Asian Americans: Francisco Junior High, Washington High, San Jose State. But then came Illinois for grad school, and Selma for activism. He was one of seven in a VW bus, organized by a Unitarian Church. In nine hours, he was in Selma, the start of what would be two weeks that would change his life. He didn’t see any other Asian Americans. But he did have a sense of danger. They went straight for the black neighborhoods where they were welcomed, put up in people’s residences in public housing, fed, and treated well. It was a lot more hospitable than the Montgomery County jail. 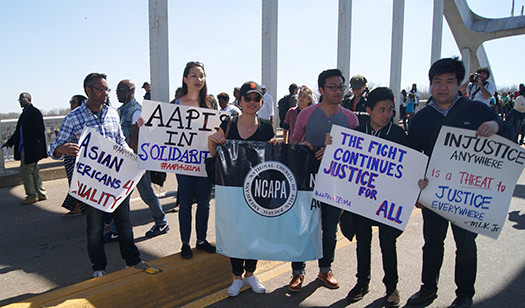 As a volunteer, Wu was put to work shuttling other activists from airports to Selma and to Montgomery. That’s when he encountered the police. Wu was profiled–he was driving while being a civil rights activist. Wu, who transported activists at the 1965 march, was jailed for one night. He stands at the new facility 50 years later. Shuttle duty was one of the more dangerous jobs for volunteers, as it turned out. As part of the transit team, Wu said he drove the same car as Viola Liuzzo, the white activist from Detroit who was shot and killed–one of the Selma deaths that galvanized activists around the nation. But the volunteer job that was more dangerous was actually being part of the team of volunteer marshals marching with Dr. King. “We were holding hands, circling around Dr. King. We walked with him from the car to the stage, like that,” Wu said of an unforgettable memory that would fuel his student activism for years. After the marches, Wu continued to drive folks to register in Alabama and Mississippi. “I remember driving like hell on the back country roads of Alabama,” Wu said. It was a quite a way to celebrate his birthday month, 50 years ago. Wu was also active in the antiwar movement and said he was likely the first in San Francisco’s Chinatown to declare himself as a conscientious objector. And that’s what struck him about Selma a few weeks ago. There are people following in his path. In 1965, Wu never saw an Asian American in all that he did at Selma, though there were a few among the thousands of protestors who came for the marches. At the 50th anniversary this month, Wu saw real progress just for Asian Americans that dates back to 1965, when the immigration laws lifted quotas and allowed more Asians into America. 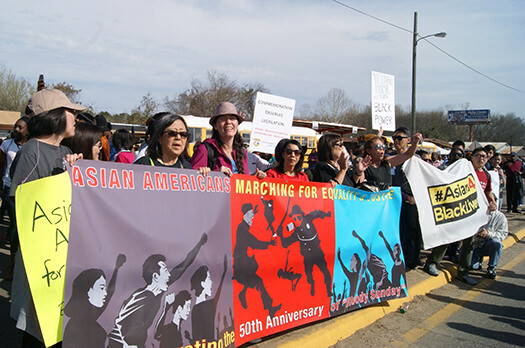 At Selma 2015, Wu saw Asian American families with three generations of activists. For the first time, Wu met Todd Endo, his wife Paula, and their grandchildren. 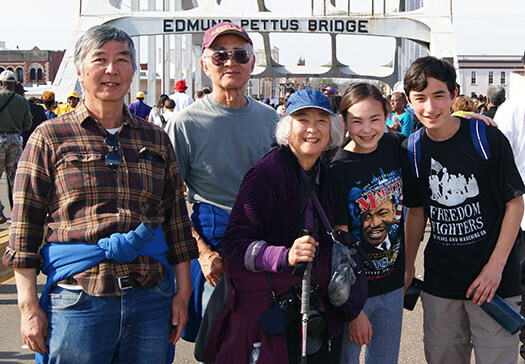 They stood on the Edmund Pettus Bridge and shared the memory of being Asian Americans at Selma 50 years ago. 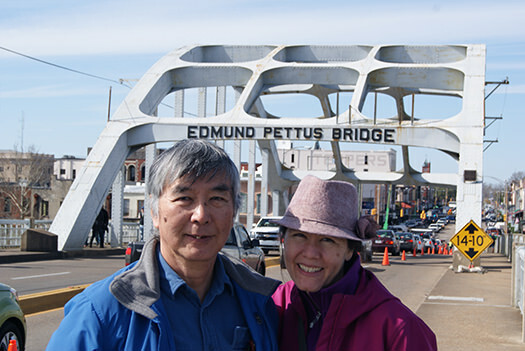 Wu met Todd Endo for the first time this month; Endo was also at Selma 50 years ago. It should give all of us real hope for the future, as the fight for equity and justice continues.